Explore new territories and olfactory cultures with the Acqua di Parma Colonia Ingredient Collection, a collection of fragrances that reveal olfactory treasures from around the world. Created to celebrate inspiring essences from across the globe while preserving the revered Italian Colonia style, the Ingredients Collection is a passionate and painstaking exploration that expands horizons. 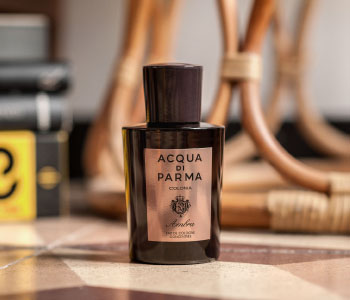 An intriguing journey of many contrasts and harmonies, from the rich sensory footprint of agarwood in the Middle East, to the artisanal leather of Tuscan workshops.